Special Containment Procedures: SCP-2856 has been acquired by the Foundation, and is currently operated by "Storage Concepts plc." (a Foundation front company) under the pretence of non-perishable goods storage. At least six personnel must remain within SCP-2856 at all times, with no fewer than three housed there permanently. Due to the proximity of SCP-2856 to Site-54, plans to outfit the location as a rapid-response vehicle hangar and low-value storage unit are currently undergoing approval. Description: SCP-2856 is a large warehouse located on the outskirts of Leipzig, Germany, formerly owned by █████ Industrial. While generally non-anomalous in structure, the walls of the building contain a semi-random network of cables composed of copper wire, woven hair, solder alloy and congealed blood. DNA testing has remained inconclusive as to the origins of these materials, and the method by which they were implanted in the walls is unclear. When exactly one living human subject is placed within SCP-2856 for a length of time exceeding 20 minutes, all entrances to the building will seal themselves via an unknown mechanism, and the subject will demanifest. All attempts to enter SCP-2856 during this time have failed. After a period of time ranging from 30 seconds to 52 minutes, SCP-2856 will re-open. In 78% of recorded tests, the subject will no longer be present, and no further contact with the subject will be made. In the remaining 22% of tests, a different human subject will be present within SCP-2856. This new subject (designated SCP-2856-1) will invariably be a human being exhibiting a number of wounds or alterations. While the majority of SCP-2856-1 instances are dead upon manifestation, living instances are occasionally produced. Due to the physical and psychological damage present in recovered instances, information recovered through interviews has been limited at best. For a complete list of all sanctioned tests with SCP-2856, see Document 2856-D. Results: Subject de-manifested as normal. No SCP-2856-1 instance produced. Results: One SCP-2856-1 instance produced, consisting of a large quantity of blood and miscellaneous viscera. No anomalous properties observed, remains incinerated. Subject: One chimpanzee, previously used for medical testing. Results: SCP-2856 failed to self-seal. Experiment aborted after 2 hours. Subject: D-600604. Subject was terminated via timed lethal injection midway through the demanifestation process. Results: SCP-2856-1 instance produced. Subject was unresponsive and showed signs of 2nd and 3rd degree burns across the majority of skin tissue. Subject expired 20 minutes after manifestation due to the replacement of 20% of all bodily fluids with a yellow-brown fluid physically identical to commercially available chicken soup1. Results: SCP-2856-1 instance produced. Subject exactly resembled D-040188 (removed during Experiment 2856-07), save for a power cord running the length of the spine and wire coils inserted in various orifices, both natural and artificial. The subject was missing both legs, and vocalised loudly upon manifestation. Due to the low possibility of useful employment following this, the subject was terminated 2 days later. Results: SCP-2856-1 instance produced. Subject appeared to be the corpse of ████ ██████, who was reported missing prior to the Foundation's acquisition of SCP-2856. Due to the presence of a large lead pipe inserted in the subject's skull, they were visually unrecognisable. Autopsy revealed the cause of death was either the overheating of the subject's blood plasma, or the insertion of a thermostat into the subject's stomach. How this was accomplished without leaving visible scarring is currently unknown. Results: Living SCP-2856-1 instance produced. Subject appeared to be in a state of shock, repeating the word “tick” at one minute intervals. Medical analysis showed extensive damage to the subject's rib-cage and spine, with a brass key partially severing the spinal cord, resulting in lower body paralysis. Subject terminated at own request 3 weeks after containment. Subject: D-030172. Subject was fitted with a camera embedded in the skull. Results: No SCP-2856-1 instance produced. Camera was eventually retrieved along with the subject's corpse during Exp-2856-96. A transcript of gathered footage is available in Document-2856-E.
<00:00> Camera is activated, subject steps into SCP-2856. 19 minutes pass without incident. <00:19> SCP-2856 self-seals. Real-time communication with the subject is lost, and they proceed to examine the interior of SCP-2856, which shows no notable changes. <00:29> All main lighting systems within SCP-2856 deactivate. The subject repeatedly vocalises regarding their distress, and attempts unsuccessfully to leave. Visuals become increasingly indistinct, with higher levels of corruption and distortion being observed than would usually be expected. <00:31> Visuals are lost. Microphone continues recording a low hum, punctuated at semi-regular intervals by the sounds of heavy machinery. <00:44> Visuals re-established. 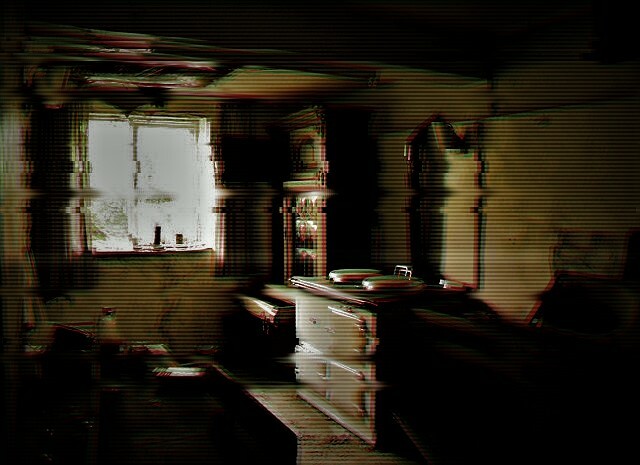 Subject appears to be standing in a dilapidated kitchen. A window to the left of the subject provides a view of barren farmland, corresponding with no known location. The sound of muffled sawing can be heard from the adjacent room, accompanied by quiet screams. Subject attempts to exit the room, but finds the door securely locked. <00:47> A mechanical entity resembling a shop mannequin (designated SCP-2856-2) enters the room. Note that the entity's head had been replaced by a ████████-brand toaster, with a crude 'face' scratched onto the front surface. Upon observing the subject, SCP-2856-2 leaves the room. D-030172 attempts to follow, but is unable. <00:48> Screams from the adjacent room cease, accompanied by the sound of grating metal. D-030172 is heard breathing heavily, and endeavors without success to open the door. <00:50> An entity resembling an arachnoid gas-powered water heater is seen passing the window, carrying what appears to be a human corpse. Large quantities of steam are emitted from both the entity and the body. <00:53> SCP-2856-2 returns, carrying two thin squares of serrated metal. The entity appears to notice the camera embedded in D-030172, and emits a low humming for approximately 30 seconds, before reaching towards the subject's forehead. Visuals are lost. <01:05> According to the timestamp present on the footage, twelve minutes have passed. The camera is positioned on a table, facing SCP-2856-2, which emits a series of rapid clicks. D-030172 is seen on the work surface behind the entity, with all limbs removed and cauterised. <01:06> SCP-2856-2 is seen turning away from the camera. The entity proceeds to forcibly open the abdominal cavity of D-030172, inserting the two squares of metal on either side of the lower spine. This opening is then re-sealed using what appear to be a combination of nails, screws, and human teeth. The subject is observed moaning quietly during this period, and footage analysis shows the subject's tongue and soft palate have been removed, as well as much of the esophagus. The expelled blood is collected in a number of buckets and pots of various size and shape. <01:08> D-030172 is observed repeatedly bringing their head into contact with the work surface, and attempting to speak. This continues for approximately 3 minutes, with SCP-2856-2 moving closer to the camera and gesturing emphatically. The sound of heavy machinery is heard from the room adjacent, accompanied by laughter. <01:11> SCP-2856-2 moves away from the camera and forcibly presses their hand against D-030172's forehead, causing massive structural damage to the subject's skull. The abdominal cavity of the subject bursts open, and smoke is expelled from the mouth, nose and ears. At no point is the subject observed to expire during this process. <01:12> The two pieces of metal, now glowing hot, are removed from the subject. They are placed to one side and coated in a mixture of butter and the subject's collected viscera. SCP-2856-2 turns back to the camera, brandishing a standard kitchen knife. No further movement other than a slight twitching is observed from the entity. <01:27> D-030172, coughing loudly, is seen moving from the work surface to the floor. At this point they are presumed to have expired. <02:14> SCP-2856-2 points repeatedly towards the camera, and emits clicks and hums of various tones and frequencies. Video footage is lost. Audio continues recording for a further seven minutes before the camera shuts down completely. No further testing with SCP-2856 is being permitted at this time. 1. All forms of testing attempted to date remain inconclusive as to the origin and/or composition of this substance.